"As doctors, we want to change lives. We want people to live a better, healthier, more complete life." 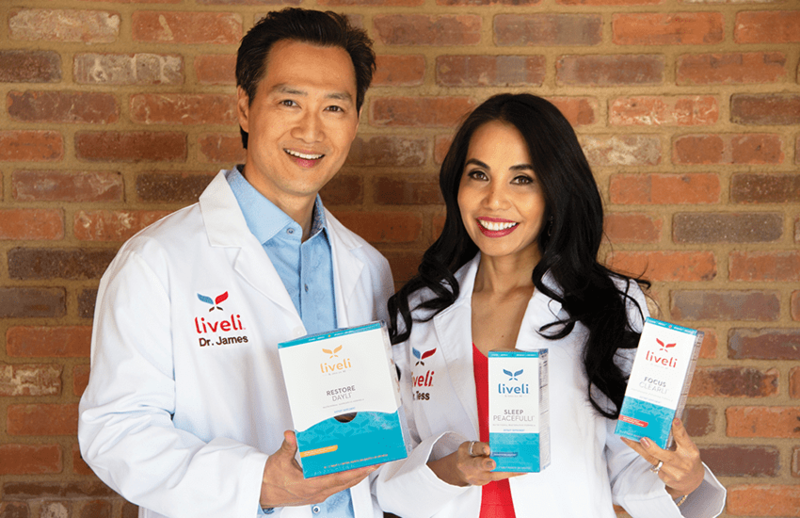 Liveli is founded by husband and wife MD power duo, Dr. James Lee and Dr. Tess Mauricio’s passion to help others. The anesthesiologist and dermatologist, who met and married while studying at Stanford medical school, were both at the top of their game until a Sunday afternoon in 2010 when Dr. James suddenly collapsed in the operating room while performing surgery. A year and a half of uncertainty later, he was finally diagnosed with a life-changing brain tumor. During this time, he experienced severe cognitive decline. The result was trying for both Dr. James and Dr. Tess. While he was undergoing chemotherapy, which eventually brought him to a full recovery, Dr. Tess faced challenges of her own. As a doctor, a business owner, a wife, a mother – and now caretaker and sole provider – Dr. Tess had to keep up with the demands of her hectic schedule and realized she needed nutritional support in order balance it all. Dr. Tess is no stranger to a challenge. Coming from humble beginnings as an immigrant from the Philippines when she was just 12 years old, she carried the responsibility of looking after her three younger siblings while her parents worked night and day to make ends meet. She worked with diligence and grit and earned a spot at Stanford Medical School, where she met Dr. James when they were assigned as lab partners. When life drastically changed directions following Dr. James’ diagnosis, she took it in stride. "This is what I was meant to do." Unsatisfied with what was on the market, the couple applied Dr. James’ background in molecular biophysics and biochemistry to design their own scientifically-formulated nootropic supplement system. Through this experience, they discovered a new life purpose — and that purpose became Liveli. Liveli breaks the mold with its comprehensive system featuring three unique formulas each targeting different aspects of brain health. Formulated with more than 70 diligently selected ingredients, Liveli is here to elevate us beyond the average so we can live all in and make every day exceptional.